The first one came in 1979. In that period of my life I worked in a bar as a diskjockey, so her name was easy to find. Let me introduce to you, this is DISCO. 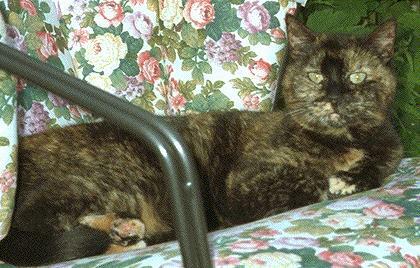 She stayed with us for more than 21 years! A remarkable long time, especially for a cat. We have let her sleep on Monday 4 December 2000 at 15.00 hours. But one pussycat is a little bit too lonely so we give a companion, the red cat you already seen before. Her name is TIGER orRED. 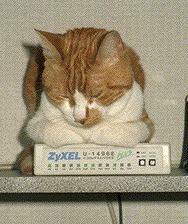 She had always a great interest for my computers, especially those nice warm modems. She left us in peace on august 29, 1996 on 23.00 hours, 17 years old.. The youngest pussycat came years later from ourBelgium friends. She is born on 25 August 1993 and is now 7 years old. 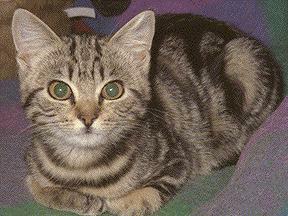 Her original name is PITOU but soon we gave her another name,Bolleke, as she was growing into the wrong direction. Over the years, her name changes to Toetje. She is the only cat left that keep us company.